Amazon.com description: Product Description: Now in paperback, the highly acclaimed and haunting work from the bestselling, internationally acclaimed author of The Invention of Solitude and The New York Trilogy. 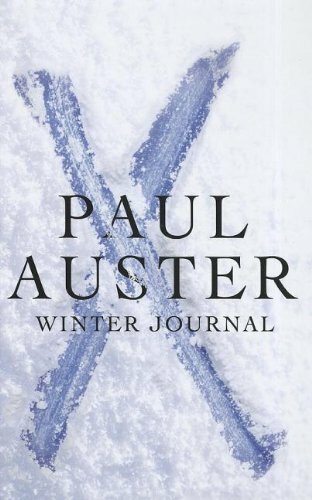 Facing his sixty-forth winter, internationally acclaimed novelist Paul Auster decides to write a journal as he sees himself aging in ways he never imagined. Compellingly written, and with dreamlike logic and urgency, the autobiographical fragments and meditations produce an extraordinary mosaic of a life. Weaving together vividly detailed stories, Auster illuminates how each small incident comes to signify a whole. Also, there are two recurring moments: one of bodily terror -- his panic attack following his mother's death in 2002; the other of joy -- his experience watching a dance piece in 1978 which releases him from writer's block just prior to his father's death. It was his father's death that began his first equally unconvential and internationally celebrated memoir, The Invention of Solitude, published thirty years ago. In Winter Journal, Auster has included an unforgettable portrait of his mother. Winter Journal is a surprising and moving meditation on time, the body, the weight of memory, a long and fulfilling marriage (with author Siri Hustvedt), and language itself by one of the most interesting and elegant writers writing today, and one with a devoted following. About: Now in paperback, the highly acclaimed and haunting work from the bestselling, internationally acclaimed author of The Invention of Solitude and The New York Trilogy.